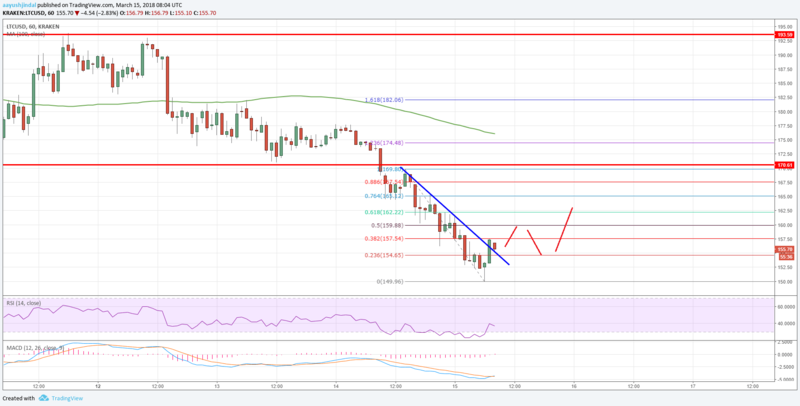 Litecoin price declined further and it even broke the $160 support against the US Dollar. LTC/USD may correct a few points in the short term, but it remains at risk below $180. Litecoin price was not able to recover and declined below the $160 support before recovering (Data feed of Kraken) against the US Dollar. There was a break above a short-term connecting bearish trend line with resistance at $155 on the hourly chart of the LTC/USD pair. The pair is correcting higher towards the $160 and $170 resistance levels. There was no respite for buyers as litecoin price did not move above the $180 level against the US dollar. The LTC/USD pair declined sharply and broke a major support at $175. It initiated a major decline and the price even broke the $160 support to move into a bearish zone. LTC is now trading well below the $180 level and the 100 hourly simple moving average. On the downside, the $150 support holds the key. A break below the mentioned $150 support could initiate more declines towards the $135-140 support area in the near term. Is Ethereum Apple? Or Is It IBM? No Repository Update on Litecoin for 4 Months?